BSNL has announced new data pack, comes with reduce the validity and some promotional offers for BSNL prepaid users. As we can see year by year BSNL graph going down in revenue growth, at other end BSNL making hikes in data packs. 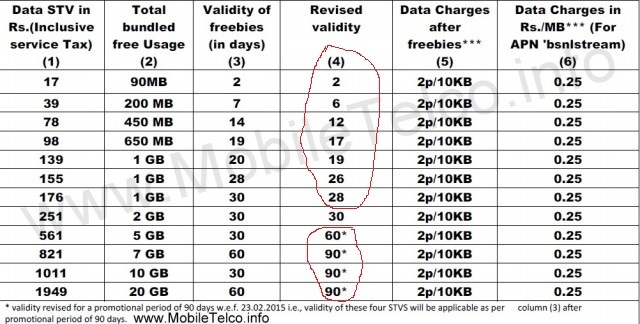 As the above offers say BSNL has straightly cut off the validity STV's on 17, 39, 78, 98, 139, 155, 176 recharges with 2, 6, 12, 17, 19, 26, 28 days respectively. BSNL also announced some promotional offers on STV's 561, 821, 1011, 1949 extended the validity on 60, 90, 90, 90 days respectively, as the promotional offer starts from 23-Feb-2015, promotional period of 90 days. What you say about the new data plan, will it fit to your pocket, or BSNL should come with some attractive offers.